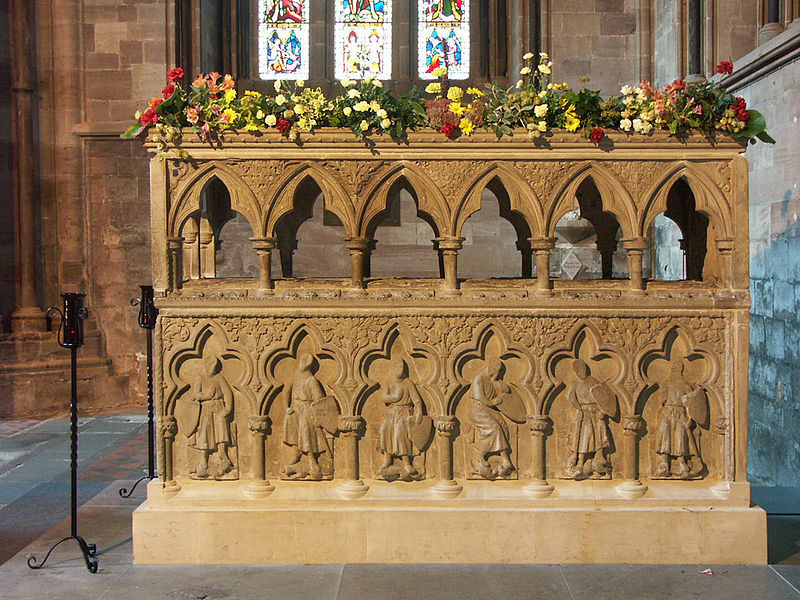 Born at Hambledon, Buckinghamshire, England, about 1218; died at Orvieto, Italy, 25 August, 1282. 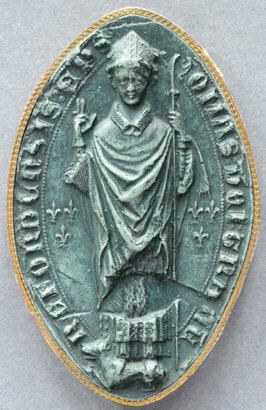 Seal of Bishop Thomas de Cantilupe. TOMAS DEI GRATIA HEREFORDENSIS EP(ISCOPU)S (Thomas by the grace of God Bishop of Hereford). He was the son of William de Cantelupe and Millicent de Gournay, and thus a member of an illustrious and influential family. He was educated under the care of his uncle, Walter de Cantelupe, Bishop of Worcester, first at Oxford then at Paris. During his studies he attended the Council of Lyons in 1245, when he became a papal chaplain. Returning to Oxford, he taught canon law, and in 1262 was elected chancellor of the university. 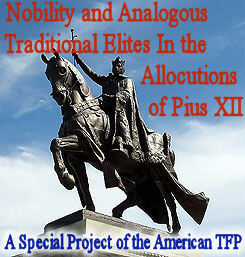 In the Barons’ Wars he took the popular side and stated the Barons’ case before St. Louis at Amiens, 1263. After the defeat of Henry III at the battle of Lewes he was made chancellor of England (22 February, 1265), gaining wide renown for his judicial wisdom and fairness. Deprived of the chancellorshp on the death of Simon de Montfort, he went into exile, lecturing at Paris on theology and Scripture (1265-72). He then resumed teaching at Oxford till 1274 when he attended the second Council of Lyons. He held several benefices which he administered most zealously, appointing responsible vicars, visiting them regularly, and showing himself a model pastor by his holiness and wide charity. In June, 1275, he was appointed Bishop of Hereford, and was consecrated by his friend Cardinal Kilwardby (8 September, 1275). As bishop he continued his apostolic life, labouring incessantly for the good of his people, maintaining the privileges and property of his diocese against Gilbert of Gloucester, Llewellyn, and others, supporting Edward I in his struggle with Llewellyn, combating the unjust practices of the Jews, and reforming the clergy, secular and regular. He came into conflict with Archbishop Peckham on questions of jurisdiction, and at the Council of Reading (July, 1279) led the resistance of the bishops to the policy of Peckham. (For the articles embodying the points in dispute see Wilkins, “Concilia”, II, 75.) His personal differences with Peckham led first to his withdrawal to Normandy that he might avoid an interdict and appeal to Rome, and subsequently in 1282 to his actual excommunication by the archbishop. He then went to Rome to plead his own cause before Pope Martin IV, who received him kindly. But his failing health succumbed to the fatigue of the journey and the summer heat. He was buried at Orvieto, but subsequently his relics were brought back to Hereford, where many miracles were wrought by his intercession and his shrine became second only to that of St. Thomas of Canterbury. He was canonized by John XXII (17 April, 1320), and his festival, formerly observed on 2 October, is now kept in England on 3 October. STRANGE, Life and Gests of Thomas of Cantelupe (Ghent, 1674; London, 1879); BOLLANDISTS, Acta SS., I Oct. (based on the Processus Canonizationis (Vatican MS. 4015) also Bib. Hag. Lat. (1901); CAPGRAVE, Nova legenda Angliae (Oxford, 1901); SURIUS, De probatis sanctorum vitis (Turin, 1875-80); BUTLER, Lives of the Saints, Oct. 2; CHALLONER, Britannia sancta (London, 1745); TOUT in Dict. Nat. Biog., s.v. Cantelupe, Thomas de (giving list of the abundant medieval materials too numerous to be quoted here); HARDY, Descriptive Catalogue (for MSS. sources), I and III (London, 1862-71); Bibl. de l’ecole de chartes, IV (Paris, 1892).